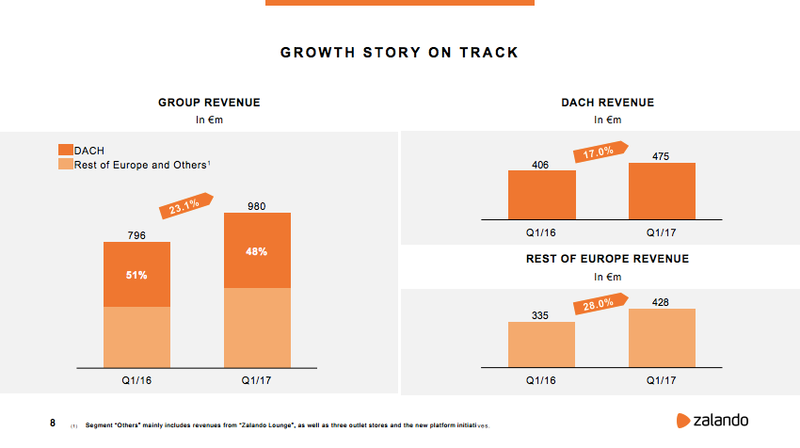 Zalando seems to have overcome the company’s weak growth period in the DACH region (DACH = Germany, Austria and Switzerland). While Q3 last year saw DACH growth at under 10%, last Q4 saw a growth rate at 17.5%. Now Q1 of 2017 saw DACH growth at 17%. Rest of Europe grew significantly faster, with an increase by 28%, and will soon overtake DACH, Zalando’s home market. Anyway, more interesting than all this is the fact that Zalando managed to activate its customers more often. Customers order more often and GMV per customer increased too. In the KPI development one can see that on average almost every active customer have ordered at least once since Q4. 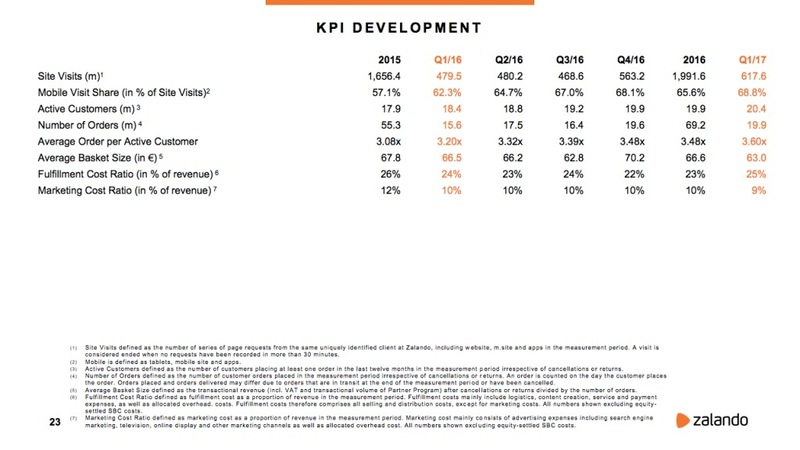 Traditionally, Zalando doesn’t provide much of an insight into how the company’s regular customers are doing and how the company handles customer retention. But my educated guess is that this almost certainly is one consequence of the move from desktop to mobile. 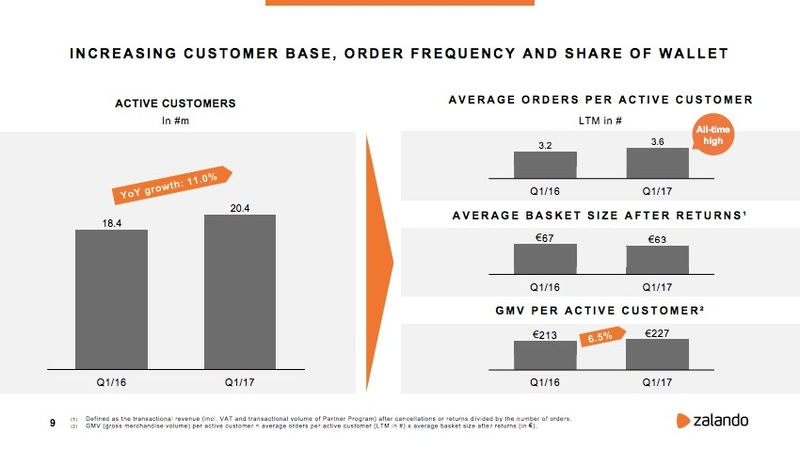 Zalando is seeing mobile order share above 50% and mobile traffic share far above 50% for a while now. So everything that changes in Zalando’s numbers is something that changed on mobile or through mobile. 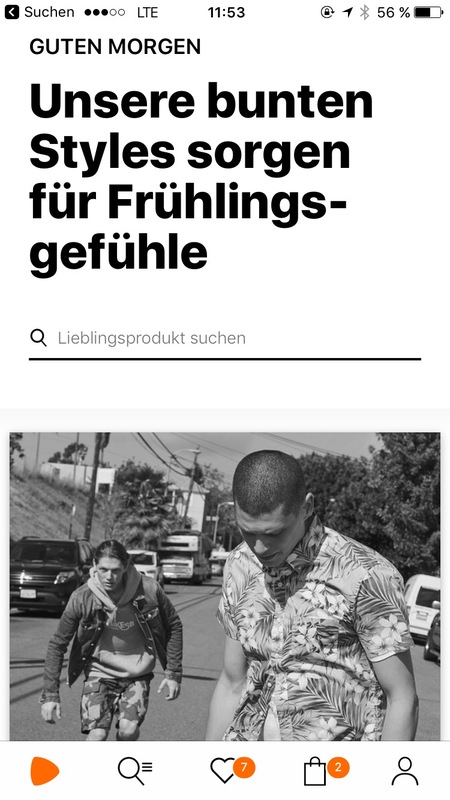 Zalando has been hard at work making the main Zalando app more friendly for mobile use, creating, for example, (a lot of) content exclusively for mobile. Even though Fleek and the other smaller mobile apps by Zalando did not break through yet, they certainly helped Zalando inform what works on mobile and what doesn’t. Think about the different ways in which Zalando uses notifications in those mobile apps. Even besides deals, notifications increase impulse shopping, thus smaller basket sizes. Combined with a mobile app that invites browsing, this looks promising. It thus fits that more active regular customers go hand in hand with lower marketing costs. (Marketing sunk below 10%.) Zalando doesn’t has to buy ads to bring customers back to the shop. All this of course makes the coming move of transforming the main app into a platform all the more interesting. The coming “Zalando Build” platform will be right at the core of the business.